Eric Lomax’s book, ‘The Railway Man’, records his terrible experiences as a Japanese prisoner of war. The book inspired the film of the same name starring Colin Firth, Nicole Kidman and Jeremy Irvine. Charmaine McMeekin is Eric’s daughter and she will speak movingly about living with the painful legacy of her father’s experiences and her own journey to find peace and reconciliation with him. Charmaine was a nurse and midwife, she is now a counsellor and psychotherapist in Edinburgh. Captain Clarkson Blackater was also captured by the Japanese in 1942 and sent to work on the notorious Burma -Thai Railway. The secret diary he kept during his ordeal became the basis of his book ‘Gods Without Reason’. His daughter, Phyllida, and grandson, Piers Bowser, will use extracts from his book, along with private letters and poems to reveal how his faith and his love for his family sustained him through his dark days in captivity. Proceeds from this event are in aid of Erskine care for ex-servicemen. The report from our ‘Legacies of Captivity’ conference, 9 – 12 June 2017, is now available to download here. On behalf of the team, thank you to all of our wonderful speakers and delegates who made the weekend so memorable. 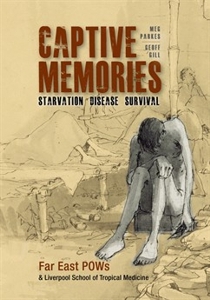 Captive Memories, a new book by LSTM’s Honorary Fellow Meg Parkes and Emeritus Professor Geoff Gill, will launch next week at an event at the Liverpool Medical Institution. The book charts the history of LSTM’s longest running collaborative project involving Far East Prisoners of War (FEPOW). At the end of WWII, even before the men returned to the UK following the end of hostilities with Japan, LSTM’s then Dean, Brian Maegraith addressed a large group of their families in Blackpool in early September 1945, answering questions about the kind of tropical diseases and infections that the men may return with. On their arrival back in the UK, the men went their own way, but in early post war months many, especially those living in the north if England, found their way to LSTM, beginning the unique scientific and medical collaboration which is now in its seventh decade. From 1967 onwards LSTM became the primary centre to carry out Tropical Disease Investigations (TDIs) for FEPOW. By this time hundreds of men had been under the care of LSTM and in the mid-1970s Dr Geoff Gill became involved in their care until the last TDI was carried out in 1999. The relationship with LSTM did not end there and out of this enduring relationship came knowledge which improved the diagnosis and treatment of some tropical diseases. In 2007 Meg began a social history project and recorded interviews with 66 former FEPOW as well as some of their wives and widows, the culmination of which is Captive Memories. It charts the history of these survivors, remembered six decades after their release. It is a touching and personal account of their captivity, survival and the struggles, both physical and psychological, faced on their release. Each person interviewed is quoted in the book which provides a fascinating history underpinned with eyewitness accounts and personal perspectives. Details of the programme of events in London to commemorate VJ (Victory over Japan) on Saturday 15th August 2015 have now been announced.